I have heard of a meetup but never a tweetup. When Rich told me a week or so ago to sign up for a tweetup over at Half Acre Beer Company, I googled the term to get an idea of what a tweetup could be. I have to admit that I was skeptical: was this going to be a bunch of twitter nerds that think they know something about beer? Rich picked me up from work and we headed for Half Acre, arriving shortly after go time: 5:30pm. There were 15 or so people already at the event. I recgonized no one, nor did I expect too. Around 6:00pm, Gabriel, the owner of Half Acre, welcomed everyone to event. 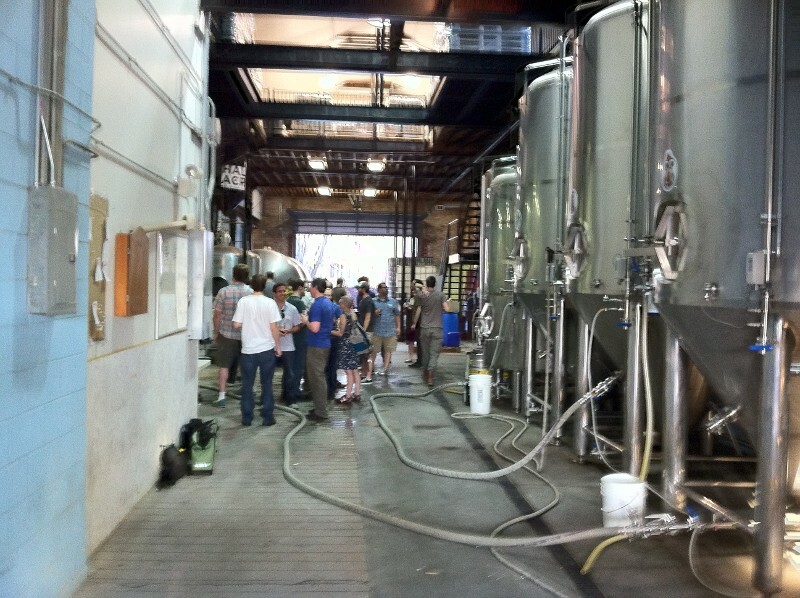 He continued that the entire staff was on hand to answer questions, give tours, that the entire brewery was open, and all the beer was on the house. Yep, that’s the Half Acre mantality that I have grown to appreciate in their time on the Chicago scene. A version of Over Ale that had been aged four months on rye bourbon barrels and never releasesd, was on tap. Others included Chocolate Camaro, The Hammer, The Bullet & The Vise, and Callow Knife. Chocolate Camaro was a very seasonable stout (<5%). Call Knife was a seasonable American Pale Ale that had nice addition of Citra hops. 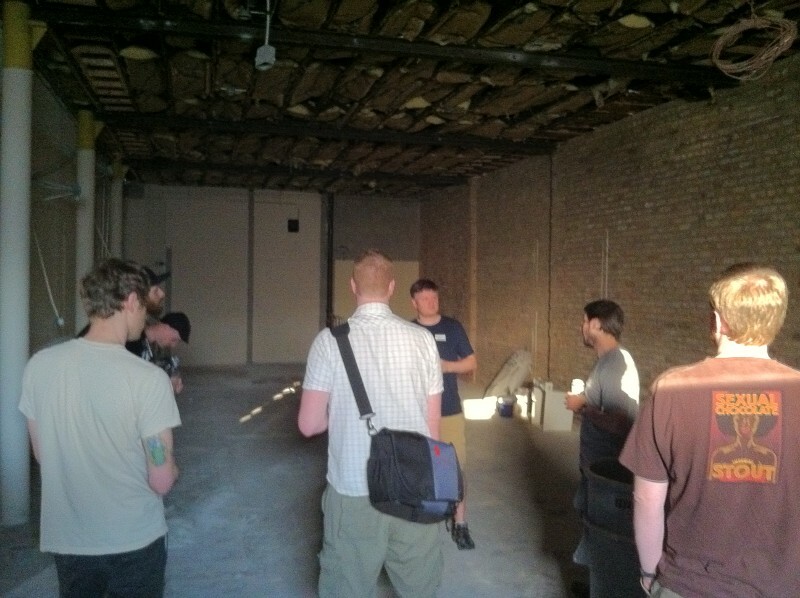 During the brief opening talk, Gabriel talked about the addition of a brew pub that was in the works. The space joins the brewery on the other side of the current front-end area and is only on the clearing out end stages. They would like to have the space open for customers in July but understand it could be much later this year. It was nice to see and talking brewing with Bryan Shimkos. He is a great guy and always has time for us beer geeks. All-in-all my first tweetup was a blast: meeting some local beer geeks, having some quality beers, learning more about Half Acre, and, most importantly, the gracious hosts and staff members of Half Acre. I am looking forward to the next. Enjoy! Useless Fact: Spiders never spin webs in structures made of chestnut wood. That is why so many European Chateux were built with chestnut beams—spider webs on a 50 foot beamed ceiling can be difficult to clean! I feel lucky that Half Acre Beer Company is within an hour of the house. I like American craft brewers that are willing to make and release one offs on a regular basis. I have yet to have one that I haven’t liked. I knew I couldn’t make it on release day and was surprised, after a phone call on Saturday, that they still had plenty left of Daily Double. My next thought quickly changed to how to convince the wife to drive out the brewery while on a date night. I barely made the suggestion and my wife was all for it. Awesome. Getting good American craft beer is always easier when the wife is 100% all in. Daily Double is loaded full of Citra hops. The tropical fruit aroma can be had from a few feet away from the glass. Joined by caramel, bread, and wood, the scent is top notch and mildly remind of Zombie Dust. The taste follows and is quite the easy drinker. If this became a year-round release, I wouldn’t complain one bit. Time to share with my each coast trading buddies. Enjoy! Useless Fact: TYPEWRITER is the longest word that can be made using the letters only on one row of the keyboard. 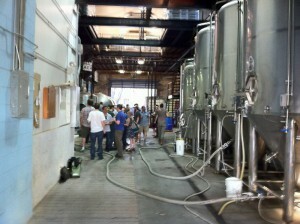 Does standing in line for a beer release automatically make an American craft beer taste better? I think that the power of the mind is at work and many times it is perceived that way. I am sure I am guilty of it. This is why I tried to go into American craft beer number 267 with an open mind, putting the 45 minute wait out of mind as well as knowing that I was one of the last people that actually could get the beer since Half Acre Beer Company ran out of Galactic Double Daisy Cutter shortly after I got to the front of the line. I didn’t take my full allotment of beer as I wanted to make sure everyone behind me had a chance. Galaxy hops is the hop that is used in Galactic Double Daisy Cutter. I believe it is a hopped from Australia, no matter, it is a complex hop with lots of citrus, tropical fruit, and pine aromas/flavors (assuming it was the only hop used in the beer). A solid hit of bitterness that might make the beer a bit unbalanced but overall made me want to run out and brew a batch of beer using the hop. Another solid one off from Half Acre. After having my first Galactic Double Daisy Cutter I wish I would have purchased my full allotment but then I came back to my senses and I am much happier that more people had a chance at this liquid goodness because I wasn’t greedy. Enjoy! Useless Fact: Humans are susceptible to a disease called the “laughing sickness.” People stricken with this disease literally laugh themselves to death. The disease is known in only one place in the world, among the Kuru tribe of New Guinea. Half Acre Beer Company continue to produce a bunch of one-offs out of their Chicago based brewery. I have no idea what the production numbers are but I do know you cannot get them outside of Chicago, they don’t even make them to the suburbs. Ambrosia is another one of those small release beers. it is an American wheat ale that seems perfect for the warm weather that hit Chicago in the middle of the week. Floral hops, wheat, and sweet malts show throughout the taste and nose. Another solid offering from Half Acre. I wish that I had more of a chance to head over there to try some of their releases that don’t’ make it into bottle form. Enjoy! Useless Fact: A person who is lost in the woods and starving can obtain nourishment by chewing on his shoes. Leather has enough nutritional value to sustain life for a short time. Thursday night brings out the quality American craft beers in droves. Last night I supplied the beer from a recent transaction that netted me a bunch of west coast, specifically Oregon, IPAs. We wanted to try them together and have the entire crew together to taste: Rich, Steve, Chuck, and myself. The NCAAs were on, so the night lasted longer than usual, with me eventually pulling Consecration by Russian River and Barrel Aged Blackout Stout by Great Lakes Brewing Company up out of the cellar to keep our palates happy and amused until basketball was finished. Both of those beers are crazy good but the earlier IPAs were more hit and miss. It seemed that several might have had a bit of age on them and the supposed large hop profile became merely an after thought to a beer that was more malt forward. Some had fallen so badly that the beer became quite resinous. 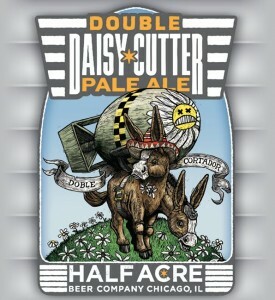 Double Daisy Cutter has only been brewed twice, that I know of, I am hoping they will brew it again and again and again. If they do I am going to try and grab more than a singular bottle in the future. Outstanding stuff. Enjoy! Useless Fact: The cruise liner, Queen Elizabeth II, moves only 6 inches (15 cm) for each gallon of diesel that it burns. Thursday night: another night to converse about the Two Beer Dudes website over a few beer reviews. What, no Rich? No problem. Chuck, a home brewing buddy, filled in and instead of conversation about TBD, it lead to the expected place: home brewing. It is getting close to that time for purchasing hop rhizomes and, in spite of Chuck having 18 or so plants in his yard, I was wondering if was going to get more. I only have one plant and the wife gave the go ahead for at least one more this year. My dilemma: I would prefer Citra or Amarillo hops. Both are not publicly grown hops, therefore their rhizomes are not available either. Now I am hoping Chuck has to cut back a few rhizomes and that might be the way I go. More to come on that topic as we move towards spring in frigid Chicagoland. Meandering through the tangled talk of home brewing was the banter about the American craft beers we were appreciating and reviewing. We only got through two beers last night, both above average, with beer number 58 shining brightest. Thunder and Son by Half Acre Brewing Company is listed as a brown ale on the bottle but really falls into the American strong ale category. Fruits abound from this beer, both in the aroma and the taste. Not just dark fruits, but some lighter fruits, middle of the spectrum and definitely not tropical. They add this nice balance to the beer that hides the high alcohol well in the taste but it blurts out in the aroma. A little age on this beer, it could be wonderful. As it is now, it is a solid offering. Enjoy! Useless Fact: A squirrel cannot contract or carry the rabies virus. It is hard to believe that I am already starting my second week of 365 American craft beers in 365 days. I have also hit a semi wall only eight days into this in terms of thinking this might be a bigger bite than I care to chew. I am wondering if tying myself to a beer for the next 357 days is going to push me past the limits of a hobby, turning it into a chore. Reviewing a beer should never, ever be considered a chore. I am quickly beginning to believe this will really become a mind game. Only eight beers in, already my second Half Acre beer. 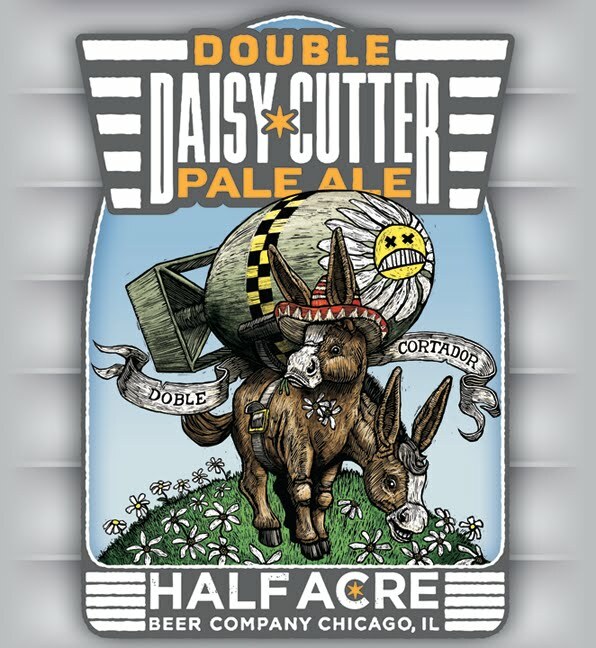 Daisy Cutter, an American Pale Ale, is handsomely dried hopped so that you can quickly fancy the citrus, grassy, and fruity notes. A juicy beer in the mouth in which the hops bring their presence to the palate without leaving much of imprint. Well balanced, crisp, and refreshing. A beer that I turn to over and over again and will continue to. 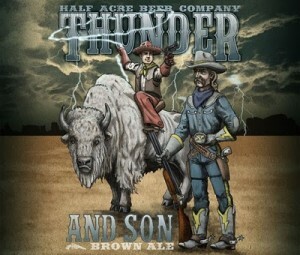 Half Acre is an up and comer over the past two years from Chicago, IL. They do some nice seasonal and on-time beers too. If you are in the neighborhood, I highly recommend just about anything they ferment. Enjoy! First off the title, in parenthesis, refers to me doing 365 Days of American Craft Beer and that I am currently on day 2. Since this is only the second day, the excitement level is very high. It seems like I will be invincible for the next 363 days. Time will tell but I am sure, just like any other long term goal, this one will have its ups and downs. Gossamer Golden Ale by Half Acre Beer Company is a Blonde Ale from one of the newer breweries in Chicago. I have been hooked on Half Acre since I first tried Daisy Cutter back almost two years ago. I solid American Pale Ale abundantly dried hopped to have aroma and more. But that is a beer for another day. I picked up Gossamer for a Secret Santa and was excited since I knew the beer had some good recommendations and I wasn’t giving away the entire four pack. The pour on the beer is nice to start and the nose quickly picks up on the dry hopping for the beer; making me want to taste asap. Bread malts are the focal point of the grain bill, giving solid backbone for the beer. The citrus and grassy hops cut through the malt, lending to a balanced beer on palate. A solid offering from Half Acre. I will be having more of this one, zoning in on the summer time especially on the patio. Enjoy!